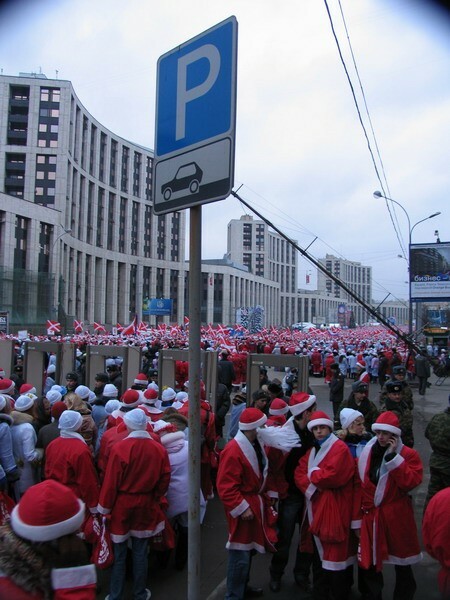 Big group of multi-national Santas took over the Moscow last weekend. You can see on those pictures the real crowd of them. The only thing that is not right – there is no snow on the streets. What was the purpose of this, if any? 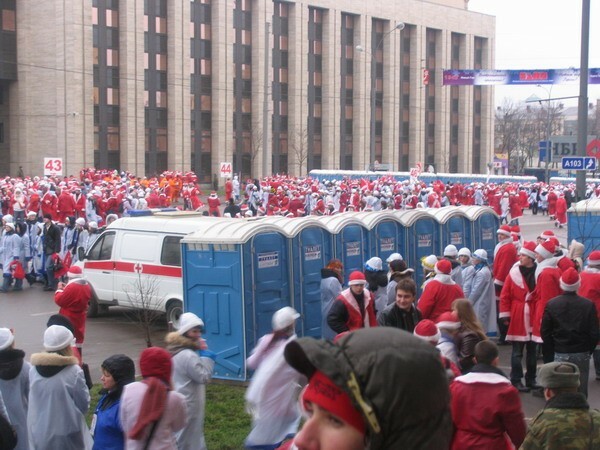 Was it just a Santa Flashmob? that symbol is used in the US to designate an abandoned building. U’r right, this is unusual winter, but not a phenomenon. i think this is a pro-Putin demonstration. 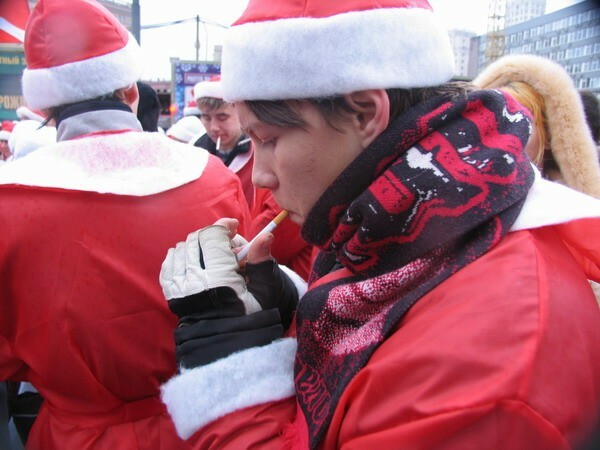 it’s called santacon, its a worldwide event! That’s the Nashi flag. They’re a youth organization. Hmm so no snow in Russia either? That’s weird, I’m Romanian, and as long as I can remember my early winters were full of snow. Now snow starts in late January over there, for the past few years. something seems to be really wrong with the climate nowadays. But what in it bad? 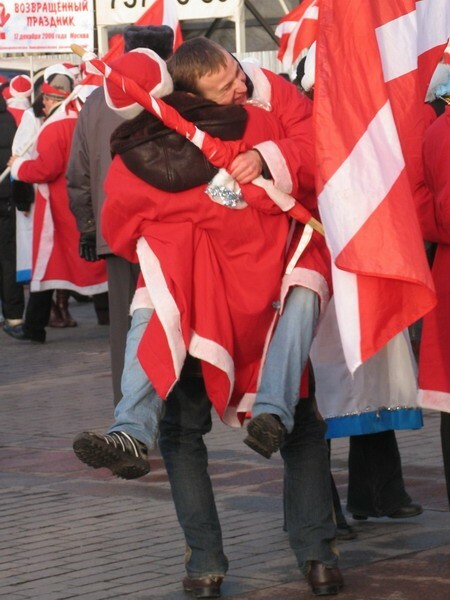 If nationalists, nazis and communists have not changed clothes in ” Dedov Morozov ” (Santas) it is their problems. Horror! December, and in the street a grass grows, and kidneys are dismissed. The truth speak after new year will be as the last winter, a minus 40C degrees.. This is an action cause by association “Nashi”. It’s a Kremlin’s project that oriented on young people. That’s why the have A LOT OF money and you can see it. Because all of those students came to Moscow from different cities free of charge (“Nashi” paid everything for them). So students usually agree to go somewhere and take a part in some action, because it’s like a free vacation for them. It’s unclear what purpose Kremlin has here. Most probably, this is a new way of propaganda in Russia and Kremlin is ready to pay a lot of money trying to establish better relationships with young people. 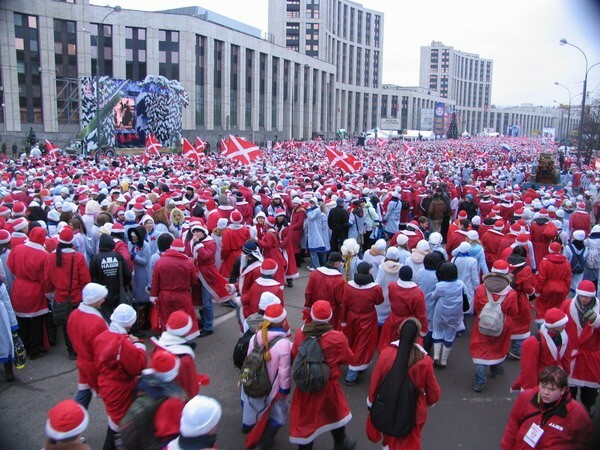 For example, there were about 70.000 of santas there! Try to count, how much money they spent on it (buy clothes for all of them, presents for veterans of WOW2, and bring all those people from different cities of Russia). About $20 mlns. I guess. They call themselves Nashi but they act like Nazi. 20th century had the Hitler Youth. 21st century has the Putin Youth. 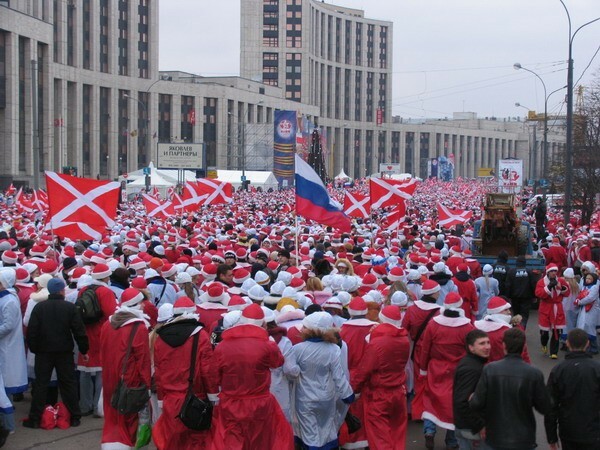 It seems that all the Santa’s are Very patriotic as they are all wearing Red. The plan of the action concludes in that “to return” to veterans front New Year. As they did not have an opportunity to celebrate new year 1941 as they battled for Moscow. And children have arrived to Moscow with the gifts made by the hands to present their heroes which 65 years ago have made a feat. Health it and heat! NASHI aren’t NAZI or something.NASHI on russian means OURS.They congratulate veterans of WW2 with New Year. p.s. Yes the nature is crazy!I live in Lithuania and the climate is strange.In the middle of autumn there was snow.But in winter there is NO SNOW! !It is the first my New Year without snow!! The lack of snow is deliberate read that article and stop being mislead. God love bing, fine stuff. Keep up the good work.